Join us as we explore VR in Space, rocket building, high altitude weather balloons, and learn how to design & code experimental microcontrollers. Drop in for one session or attend all eight! This program is designed for teens and adults. This is an eight-week series on Tuesdays from 6:00 - 7:30 PM starting on March 5th. 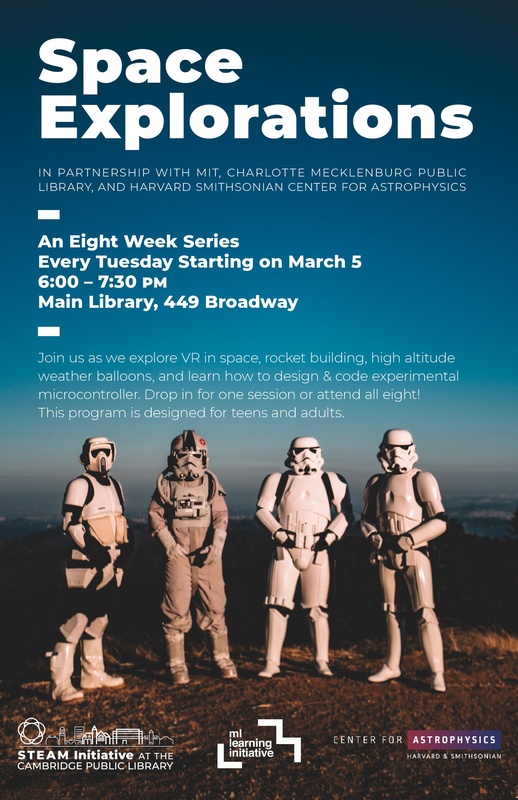 Offered in partnership with MIT Media Lab Learning Initiative, MIT Media Lab Space Exploration Initiative, Charlotte Mecklenburg Public Library, and the Harvard Smithsonian Center for Astrophysics. Location: March 5th, 12th, & 19th - Community Room, March 26th - Curious George Room, April - newly renovated Learning Lab!